I love bees (and bugs in general really), so I was so excited for #firedazedaugust’s last prompt Busy Bees. 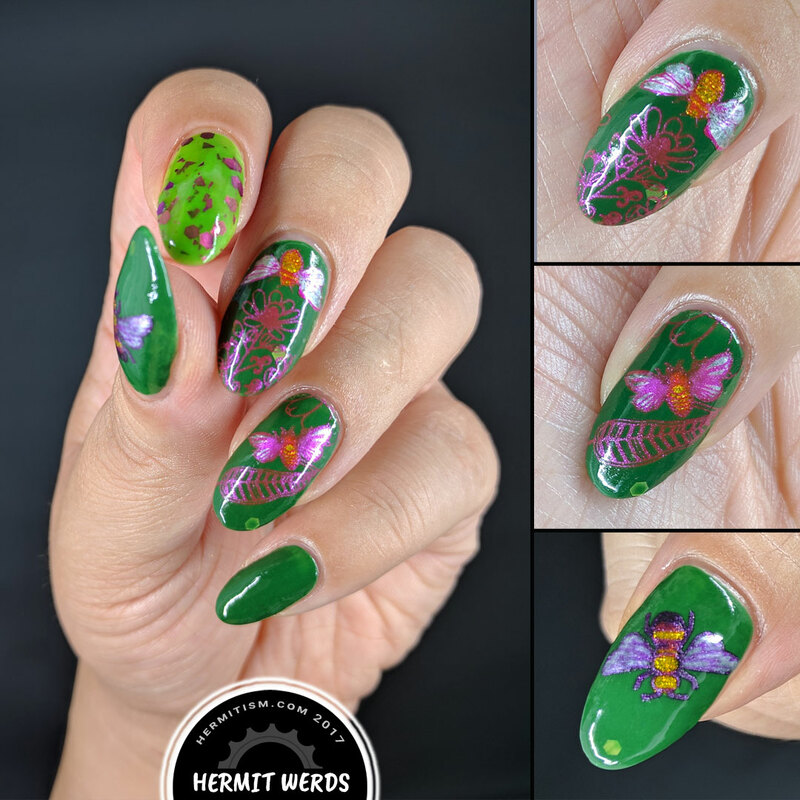 I haven’t done a truly green manicure in a while so I decided to go for a garden-view of bees working (which also gives me my fourth Nail Challenge Collaborative flower nail art). 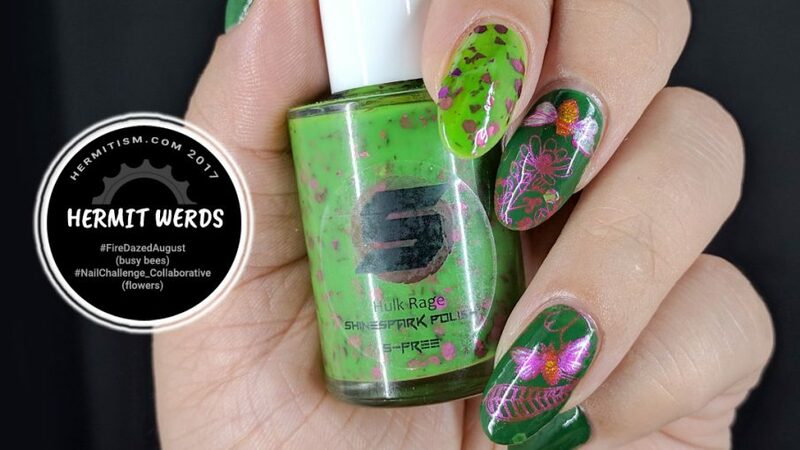 It helped that my order from Shinespark Polish arrived and I had some green polishes I was super excited about to play with. 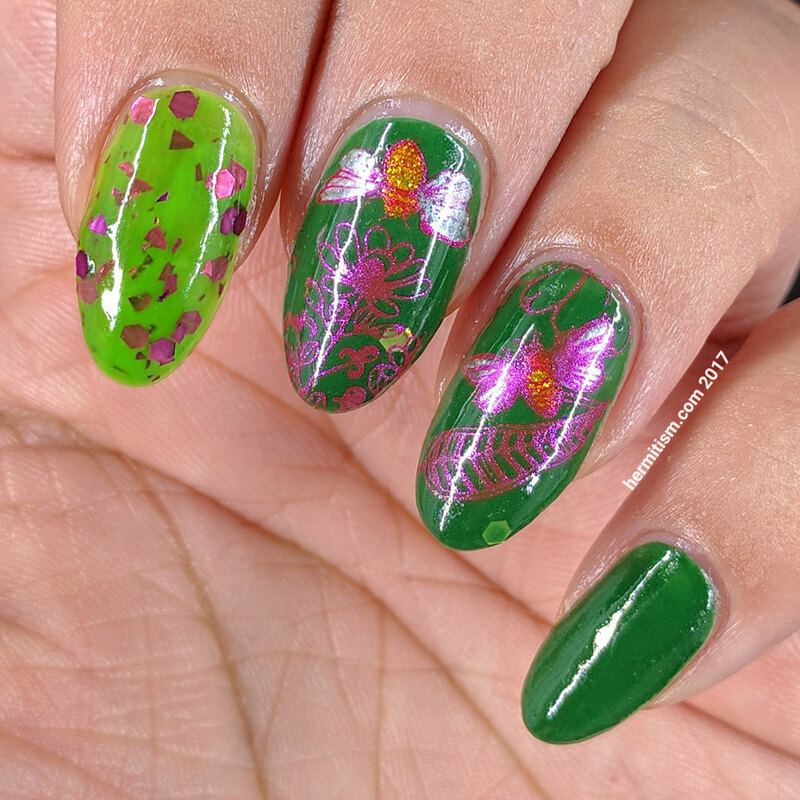 So the stamping color came from the beautiful glitter in “Hulk Rage” (which came in a set with a lovely one-coat-er brown) and the darker green is “Link” from a set focused on the Zelda games (which I have a history of enjoying but not completing…yet). I didn’t have a gradient in the background. I just had one solid dark color. I used a different brand of polish that wasn’t specifically a stamping polish. I am probably going to pick up more of those lovely Pueen metallics sometime. The stamping plates were cheaper with finer lines and more shallow etchings which means the layer of metallic polish on my nails was thinner and less opaque. In fact, part of the wings would not pick up at all and I had to kinda sketch it in with a pin. Either way, all the photos are with a glossy top coat because the matte ones just looked meh. I love these nails though. So I’m trapped. Because I have a different manicure on each hand and I’m not ready to take them off, but I have kirin nails to paint tomorrow that I am very excited about. So. I am going to be painting them on false nails. It’s going to be cool, I hope. I’m starting to accumulate quite a pile of finished false nails. I’m not sure what I’m going to do with them. Maybe I should sell them? Oh – I love that your bee design isn’t yellow & black!! Definitely a garden view! 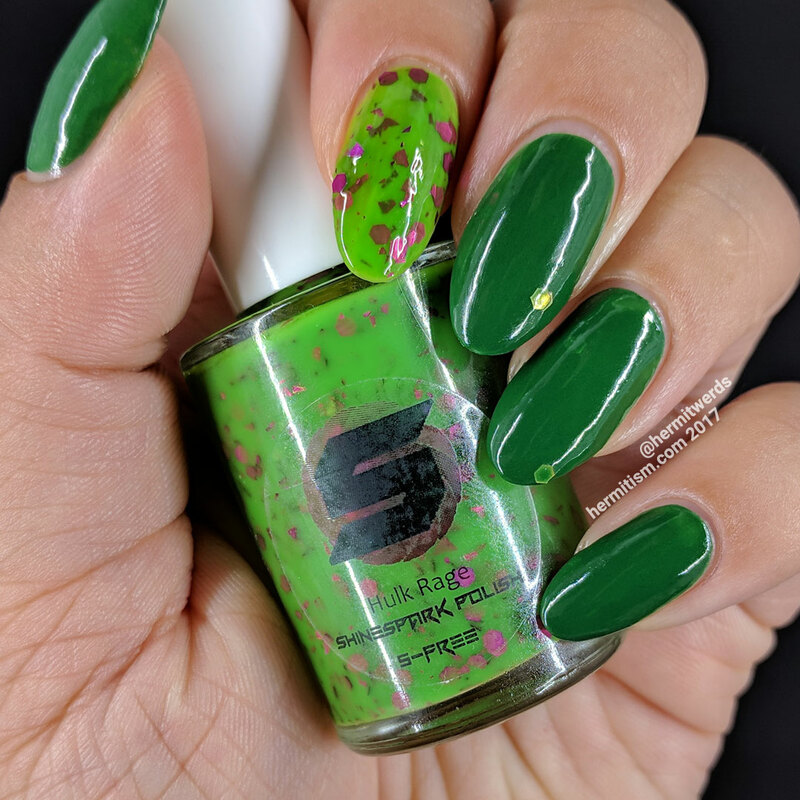 Isn’t it frustrating sometimes that an effect you get with one combination of polishes/plates doesn’t quite work out with another combination. Regardless – these are fun and very lovely!! I wouldn’t want to take them off either. I like your idea of increasing your nail art creations by using false tips…I think I should look into that too. 😉 And, you do a really lovely job of showing off polish without art too! Nice bonus.